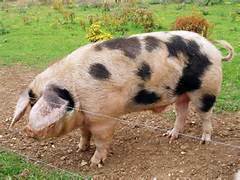 Here at Upper Muirhall we also rear rare breed pigs. 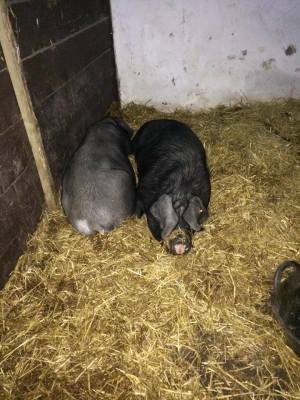 We have Gloucester Old Spot (GOS) sows which we put to a GOS cross Tamworth Boar producing a hardy, well shaped pig that will thrive outdoors all year round. 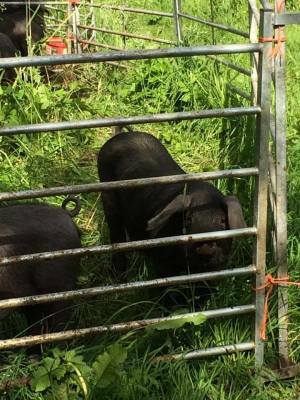 We also have two Large Black sows, have recently purchased a pedigree Large Black boar and will be breeding pedigree Large Black pigs and doing our bit to save this very rare breed. Because the Large Black is a slow growing pig it has fallen out of favour from a commercial standpoint, however the flavour of the meat is absolutely superb and we feel sure our customers will appreciate the difference. We currently have pigs being finished that will be ready in the next few weeks. We are currently taking orders for whole and half pigs for your freezer with smaller cuts available soon.